Now that Nate Marquardt has laid claim to the Strikeforce welterweight belt, which Nick Diaz left behind when he moved over to the UFC, the debate as to who will face the new champ is underway. Front and center in this discussion is the resurgent Roger Bowling, who hopes to eliminate one of his leading competitors on August 18th, when he fights Tarec Saffiedine. Aside from a unanimous decision loss to the highly regarded Tyron Woodley last January, Saffiedine has won all four of his other Strikeforce bouts. 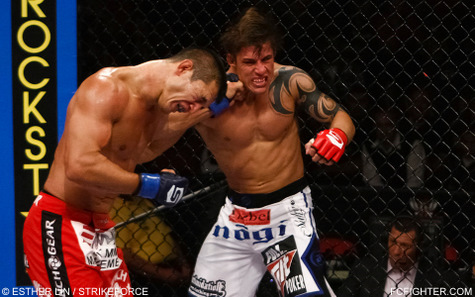 To date, the Team Quest fighter has scored wins over Nate Moore, James Terry, Scott Smith and most recently Tyler Stinson under the Strikeforce banner. Bowling mentioned “breaking through”, as since he was stopped by Bobby Voelker last July to end their memorable rubber match series, the 29 year-old has scored back-to-back stoppage wins. In December, Bowling knocked out Jerron Peoples in just 42 seconds, and this past March, he stopped Brandon Saling in the second round to extend his overall record to 11-2. When Full Contact Fighter spoke with Saffiedine recently, the experienced striker was quick to credit Bowling for his explosiveness, but relayed that he believed he was the more technical fighter. As a result, Saffiedine believes Bowling may look to close the distance or try to take the fight to the mat. In other words, while Saffiedine continues to work on all areas of his game, so is the pugilist Bowling. 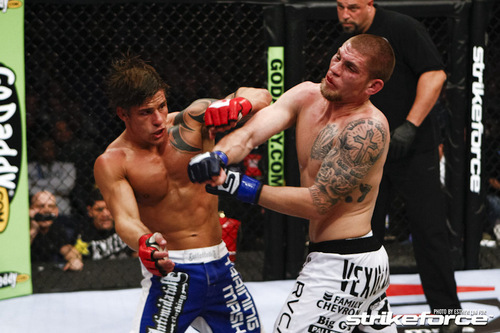 The upcoming August 18th Strikeforce card will be hosted by San Diego’s Valley View Casino Centre.